So you have gotten onto some mailing list which was entertaining at first, but is now a drag, time sink or just filling up your mailbox with gigabits of unwanted emails. How do you unsubscribe? What you do not do is send an email to the list with the word unsubscribe in the body. A long, long, long, time ago as in before 1988.. many mailing list software programs would unsubscribe you if you did exactly what Bob did above. When an email went to the list software it would look through all the text and if it found the words unsubscribe it would do that. Of course if you sent an email using that word for some other reason you ended up off the list with little idea why. The next version of the mailing list software would just do this if the unsubscribe was by itself like Bob did above. This worked "ok" in the world of RFC822 where what you saw is what you sent and nothing special was added. It didn't work for in the world of MIME, HTML or other formats (say not an ARPA email but a BITNET email) as the Internet became "mainstream" around 1994 or so. At this point a lot of people were accidentally unsubscribing or being maliciously unsubscribed by trolls who would forge emails saying they were bob@foo.org but weren't. By the time the third generation of mailing list software came around in 1998, most software does allow for a naked unsubscribe to get you off the list. Instead you either have to go to a specific webpage and unsubscribe or have to email a specific alias that will start the process of un-subscription. For the web it is usually a multi step process of you go to link, you log in, you unsubscribe and you get a confirmation email that you were unsubscribed. For the email address you will usually get an email sent to you asking if you really want to unsubscribe and if you do email back with a special one time code included in the email. This is all because of the ever present malicious troll problem of people who think it is loads of fun to harass people either because that person exists or for the 'lols' which they seem to trade under their bridges for self-validation. So from the above we have an unsubscribe for ezmlm mailing list system which is to send an email to a specific email address. 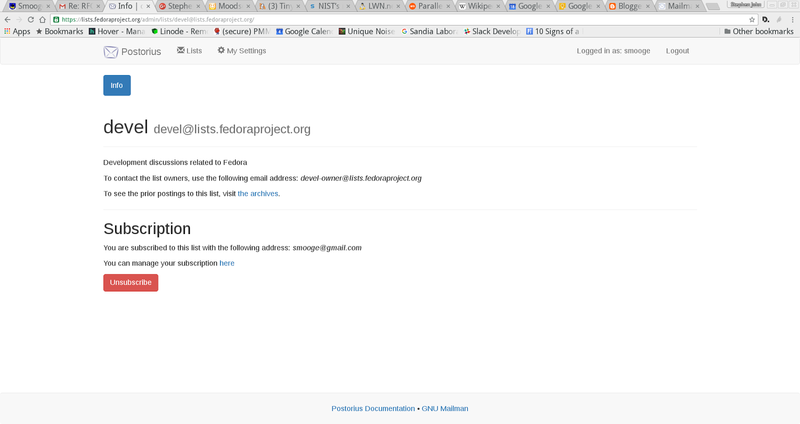 For the Fedora lists we use Mailman 3 which has both a mailing list address and a web page to go to start the unsubscribe process. How do you find these hidden headers? It depends on the mail software you are using. Most of them have some sort of "Show original" or "Show Source" which will pop up a new window which will show a lot of headers. In other mailing list software, you will see a button which says "unsubscribe" which will look for the headers and then fire off the things it says in there. Click on unsubscribe, and you should be unsubscribed from the list. It is a lot more steps than just typing "unsubscribe" in an email, but in a self-service world that has a lot of trolls.. it is what you end up doing. 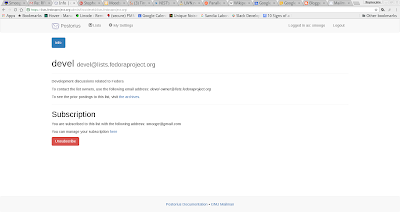 Fedora Statistics: Questions and answers.